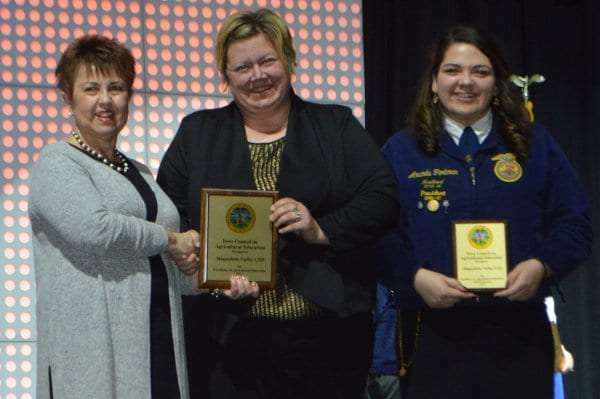 The Maquoketa FFA Chapter was recently honored with two statewide awards. The Iowa Council on Agricultural Education awarded the chapter with the 2017 Excellence in Agriculture Education award during the Iowa FFA Leadership Conference in Ames a few weeks ago. Maquoketa Valley ag instructor and FFA advisor Dawn Mausser was also honored with the Council’s Adult Education Award. Mausser says it’s a huge honor – not only to receive the award, but to get to live out her dream job. The MV FFA Chapter also includes students from Beckman in Dyersville and its members are known for being extremely active in contests and other activities across Delaware County and the state. The program was nominated for the award by more than a dozen student members, who wrote essays talking about the positive impact the program has had on their lives. That’s MV junior Cassi Westhoff. Fellow FFA member Josie Young says the program has opened many doors for her. And it’s obvious that the students love their instructor, who they affectionately refer to as “Mausser”. Mausser says they’re more than just an FFA chapter. Maquoketa Valley was among just five FFA chapters recognized in the entire state.